You’ve already seen all the books, seminars, and presentations of success. How is this one different? Most people miss the fact that the keys to success need to be used in concert with each other. It is possible to have a motive that is different from your goal, which doesn’t line up with your plan. All the components need to be pointed in the same direction. With The Success System That Never Fails, Bill and Em Johnson teach you practical ways to create synergy and activate your full potential. It’s not enough to know what to do – you have to know how to do it. 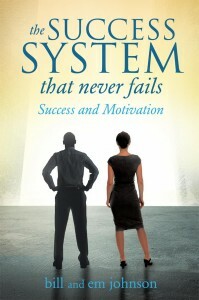 While other books on success continue to give you the same parts, Bill and Em show you how to make a whole. Step by step you will learn how the keys of success relate to one another and why it matters to have the right attitude. It’s not about opportunity, resources, education or finances; there are people with access to all four who still don’t become successful and fulfilled. Success is not a destination, it’s a journey – Bill and Em want to tell you about theirs and share the success principles they have been teaching for more than 30 years. They’ll help you recognize the motive that dominates your thought to help you turn powerful thoughts into realistic results. Copyright © 2019 Welcome to bill and em johnson's website.